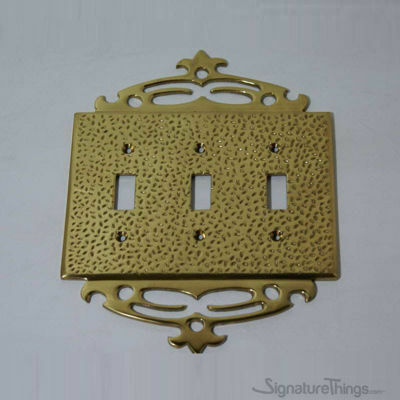 Great for rooms with multiple fixtures, this Floral Design Solid Brass Triple toggle switch plate can accommodate three toggle switches. Give your home a charming accent with this Hammered with Top Receptacle single duplex switch plate. This piece is perfect for achieving a French style. Covers a standard duplex electrical outlet system. Add a touch of Greek style to your home with this solid brass Single toggle switch plate. Accommodates one paddle switch or GFI outlet. 71661 Single toggle switch plate. Plain and Simple way to put the curtains away from the window to enjoy the view. This is a J shaped Hook with clean plain lines. Give your living area a sense of style that will be hard not to notice. This decorative curtain holdbacks will subtly enhance your decor without being audacious. This single duplex switch plate is constructed of solid brass with a unique straight rope border and cross rope design at the edge centers that makes for a suitable addition to your vintage-styled home. 71704 SWITCH PLATE - RECEPTACLE-4-7/8" long x 3-3/8" wide. Add a touch of flair to your home with this solid brass combo toggle switch and duplex cover plate. This decora plate features an intricate cross design pattern around the edges and will accommodate a GFI outlet or paddle switch. 71705 SWITCH PLATE - COMBINATION-4-1/4" long x 5" wide. Add this French Design Classic Switch Plate to your home for added charm and flair. This plate made of solid brass and features a delicate floral design around the edges. It’s a combination of toggle switches and duplex cover plate. 71675 FRENCH DESIGN - COMBINATION-5-1/2" long x 4-1/4" wide. With a beautiful finish, the high-quality flower pattern Solid Bronze French Design Receptacle will be a welcome addition to any room in your home. 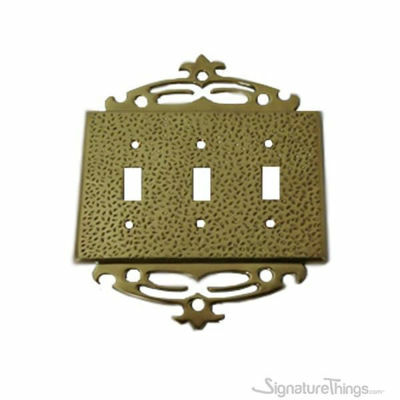 This French Design Triple toggle switch plate has a beautifully crafted flower pattern, and features the hammered pattern on the surface. Accommodates three toggle switches.